OPTP is a premier supplier of fitness and rehabilitation products, as well as the latest educational resources. They align themselves with industry experts to provide the best products at affordable prices. Their dedication to excellence, quality, and customer services has built a worldwide reputation for them as a trusted source. A new OPTP exclusive, The Pilates TRIADBALL Manual, written by Pilates master teachers Michael Fritzke and Ton Voogt, contains over 270 illustrated exercises and variations to strengthen, align and sculpt your body without classic Pilates equipment. 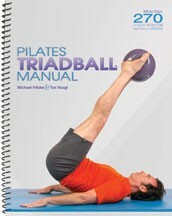 The manual serves as a starting point for integrating the TRIADBALL into workouts and physical therapy sessions. The Pilates TRIADBALL Manual is a user friendly resource; a sample workout is included in the book as a great start for trainers and clients. The manual is illustrated, has a soft cover with spiral binding and is 180 pages. "The TRIADBALL Manual is a well-organized and comprehensive instruction book. The exercises are clearly written with step-by-step directions, goals and tips that make a workout more effective. 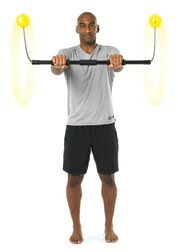 With the TRIADBALL you can choose to have more support for an exercise or make it more challenging. The TRIADBALL offers a new dimension to the mat work," said Kathy Corey, master Pilates instructor. The exclusive material and texture is what creates the "dynamic elasticity" of the TRIADBALL strong yet pliable, supportive yet squeezable at the same time. Even when the TRIADBALL is not fully inflated it will not lose or decrease its support, comfort and functionality. Numerous trainers, yoga instructors, fitness instructors and physical therapists are utilizing the dynamic nature and elements of the TRIADBALL to successfully integrate it into their sessions. If you would like more information on the TRIADBALL Manual, or a free OPTP catalog, call or visit online. The lumbopelvic-hip complex is a key site of pain and disability. Its primary function is to transfer loads safely while addressing essential movement requirements. Continued use of non-optimal strategies for transferring load ultimately leads to pathoanatomical changes and excessive stress on joints. Metabolic, systemic, inflammatory, and infective conditions may also cause degenerative changes to the structure and function of the lumbar spine, pelvic girdle, and hips. The Pelvic Girdle, by Diane Lee and Linda-Joy Lee, provides the an evidence-based approach to the examination, diagnosis and treatment of the lumbopelvic-hip complex. In addition to an overview of the structure, normal kinematics, and dysfunction of the lumbopelvic-hip region, this updated text offers tools and techniques for effective practice. Photos accompany descriptions of techniques and strategies in an easy-to-read clinician-friendly format. 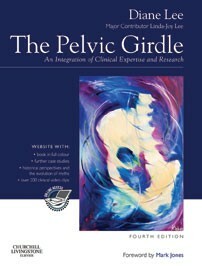 The Pelvic Girdle moves beyond a simple "how-to" book. The fourth edition emphatically presents a new model for clinical reasoning, decision-making and the development of clinical expertise. The Integrated Systems Model provides a systematic methodology for investigating the myofascial, neural, articular, and visceral origins of pain and facilitates the resolution of a patient's unique clinical puzzle. Real case reports and over 240 online video clips help demonstrate the application of The Integrated Systems Model. 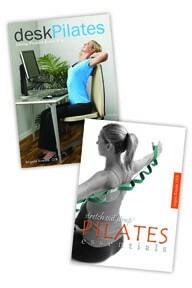 OPTP has added two new booklets by Angela Kneale, OTR that feature Pilates exercises. The first of these books, Desk Pilates: Living Pilates Every Day brings the benefits of a little recess into each day increasing variety of movement, improving posture, emphasizing strength and flexibility. Desk Pilates, introduces Pilates principles, core muscles and practical ways to align your body while sitting. The Desk Pilates exercise sequence can be performed in its entirety or focus on a few mind-body movements during your day. Stretch Out Strap Pilates Essentials by Angela Kneale, OTR, targets dynamic exercises that both lengthen and strengthen the body, while challenging core stability and control. Using the Stretch Out Strap during exercise provides sensory feedback that helps develop better posture, flexibility, muscular balance, and body symmetry, as well as core strength and shoulder stability. These exercises heighten body awareness and relieve stress, focusing on deep breathing and quality, controlled movements. These books and others, including additional books by Angela Kneale, OTR, are available from OPTP. Call for more information or a free catalog. Cultivating embodiment and developing performance in sport, dance and life in general, the Franklin Method deftly weaves imagery, movement exercises and proprioceptive tools. The newest tool, the Franklin Fascia Roll, is a peanut-shaped massager that is filled with water for added weight and a completely unique feel. The same size and shape as the popular air-filled Franklin Mini Roll, the Fascia Roll can be used for tension-releasing massage of the muscles and fascia, or to support and stimulate the body during Franklin Method movement and imagery exercises. The Fascia Roll measures approximately 3 3/4 inches in diameter and 6 1/4 inches in length. It weighs 1 1/2 pounds. Franklin Method balls, rolls and massagers, along with books by Eric Franklin are available exclusively from OPTP. Visit optp.com or call 800-367-7393 to learn more. With WebExercises Desktop exercise software from OPTP, patients will benefit from a clear understanding of your home care exercises. They will no longer have to rely on memory for what they are supposed to do and how many times they are supposed to do it. Your patient's satisfaction and their sense of well-being will create referrals and increase productivity, both in patient adherence and in the reputation of your clinic for utilizing this technology. WebExercises Desktop gives you or your staff the ability to quickly and easily create concise and personalized patient exercise Rx, selecting from over 1,000 clinically accepted exercises and stretches for all parts of the body. Instruction sheets can be printed or delivered by email, customized with your clinic's name and logo. 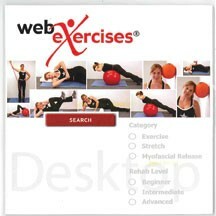 WebExercises Desktop features: 1,000 exercises and stretches; 2,000 photos; Email and video option available with over 1,000 video demonstrations; Beginner, Intermediate and Advanced levels for all exercises; the ability to create templates of favorite exercises to save time and increase efficiency; pre-made templates with treatment protocol recommendations; search exercises database by body part, specific muscle or functional activity; refine search criteria based on equipment including exercise ball, resistance bands and more; thumbnails and previews for quick scanning; and the ability to modify exercise prescription and enter clinical notes. Windows PC and Mac compatible. For more information on this product and others or for your free catalog, contact OPTP by phone or visit online. The newly-updated second edition of Foam Roller Techniques is now available with full color images and new anatomical diagrams. This OPTP exclusive guide contains 47 pages of descriptive instructions and clear photo demonstrations of self-massage techniques, using the foam roller for each muscle group. To understand the benefits of foam roller therapy, one can look to the benefits of massage in general. Fascia is prone to soft tissue adhesions, including taut bands and knots; it needs to be stretched and massaged to maintain its elasticity and extensibility. Self-massage on the foam roller is comparable to deep tissue massage, myofascial release, and trigger point therapy. Performing foam roller exercises on a regular basis will help increase flexibility, reduce muscle tension and pain, and improve rehab and fitness outcomes. OPTP (Orthopedic Physical Therapy Products) is a premier provider of an extensive range of physical therapy, fitness and wellness products, including many exclusive and innovative tools and resources developed by renowned experts. Over the past 30 years, they have built a worldwide reputation for providing exceptional customer service and quality products. For more information on Foam Roller Techniques, or a free OPTP catalog, visit their website. OPTP encourages chiropractors to discover the healing power of their Rotational Trainer. A remarkable therapeutic device for shoulder patients, it features a lightweight bar with a foam center and outermost handles. Cable holds rotatable whiffle balls on both ends. As the user rotates the balls either forward or backward on a plane, the balls generate a resistive, centripetal force that challenges the user to stabilize and strengthen engaged muscle groups. When used as a rehabilitative tool, the Rotational Trainer should be implemented appropriately within the parameters of the injury or post-operative protocol; this device is a component of the restorative process. And for general strengthening and core work, it becomes an excellent adjunct to other programs, offering total strengthening of the core, shoulder and girdle muscles. For rehabilitative and non-rehabilitative purposes, the Rotational Trainer can be used while standing, sitting or lying, and in conjunction with other therapeutic tools. 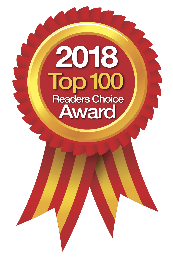 For 30 years, OPTP (Orthopedic Physical Therapy Products) has been a recognized leader in providing healthcare and fitness professionals with orthopedic, physical therapy, rehabilitation and fitness products. OPTP believes that trends toward self-care, coupled with efforts to contain healthcare costs, are shaping impressive opportunities for those who deliver conservative care. For more information on the Rotational Trainer and other high quality OPTP products, or to obtain a free catalog, visit www.optp.com or call the company at 800-367-7393. The TRS Activ8r, an inspired new approach to soft-tissue release, is designed to prevent nagging injuries, maximize performance, or rehabilitate from injury or daily stress. The contoured profile and silicone construction set it apart from other myofascial release products. The Activ8r is perfect for home, clinic or gym; it is easy to store and transport, it can be frozen for a cold compress, it is dishwasher safe for easy sanitization, and it benefits the entire body. The anatomically contoured design of the TRS Activ8r sinks deep into tissue for an invigorating myofascial release. When used for thoracic mobilizations, the Activ8r arches over the spine, simultaneously penetrating the muscles on both sides. Although perfect for the treatment of back pain and stiffness, the TRS Activ8r is part of a full-body release system. Developed by health and fitness experts who have trained everyone from the newly active to professional athletes, TRS (Tension Relief System) is a program of release exercises and range-of-motion stretches that can relieve back pain, improve posture, increase range of motion and prevent future pain, tension and injury; the Activ8r is the system's mobilization tool. Each Activ8r includes a poster that thoroughly introduces the Tension Relief System and demonstrates thirteen mobilizations, covering the full body: from the shoulders to the feet. The TRS Activ8r is an ideal recommendation for patients and increases compliancy with their home exercise program, as it reaches areas that rollers and sticks cannot, it is more user-friendly than tennis balls and it includes all necessary information for proper use. It is also a productive tool within the clinic that can be used to deliver deep, accurate pressure without causing undue stress on the therapist's hands, and it is an effective stretching aid. The more patients know about pain, the better off they will be. Physical therapist Adriaan Louw's popular series of patient books helps treat chronic pain by educating patients on the complex neuroscience of pain in an easily approachable format. His newest book, Why Pelvic Pain Hurts: Neuroscience Education for Patients with Pelvic Pain, deftly weaves through the complexities of chronic pelvic pain to reveal what is causing the patient's pain and puts them on the path to recovery. 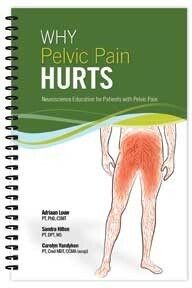 Co-authoring this newest patient book are physical therapists Sandra Hilton and Carolyn Vandyken. Research not only shows that patients in pain want to know more about their pain, but also that those who know more about pain will function better, feel less pain and be more willing to participate in therapy. Unfortunately, much of the patient education these days is based on the outdated, 350-year-old Cartesian model of pain. This biomedical model assumes that injury and pain are the same, and it steers patient education toward teaching anatomy and using terms like "bulging," "rupture" and "tear." This approach is not only faulty, but may increase fear and anxiety. Since it is now well established that pain that lasts longer than the normal healing period is more likely due to an extra-sensitive nervous system, it is time for patients to stop learning about anatomy and start learning about pain. Why Pelvic Pain Hurts uses images and metaphors to change a patient's cognitions regarding their chronic pelvic pain, which alleviates their fears, calms their nervous system and motivates them to participate in therapeutic movement and goal setting. The 70-page patient book is written in patient-friendly language and features full-color illustrations. Home exercise programs are a valuable part of any treatment, but they are often done incorrectly or ignored altogether. The fully revised second editions of Lumbar Spinal Stabilization Floor Exercises and Cervical Spinal Stabilization Exercises, by Dr. Donald Murphy, DC, and Dr. Gary Ierna, DC, help improve patient technique and compliance by detailing each exercise with step-by-step instructions and high-quality color images. This low-cost series of patient exercise books is ideal for prescribing home exercise programs, not only helping improve compliance, but also improving clinical efficiency. With exercises intuitively sorted into tracks, it is easy to prescribe specific exercise types with confidence. The lumbar book teaches neutral spine and the co-contraction maneuver in the Preparation section before dividing exercises into Supine, Bridge, Quadruped and Lunge/Squat tracks. The cervical book features Oculomotor, Hanging Head (Isometric and Isotonic), Neck Ball (Isometric and Isotonic), Cervical Stabilization and Postural exercise tracks. Dr. Donald Murphy is an internationally recognized clinician, author and researcher. 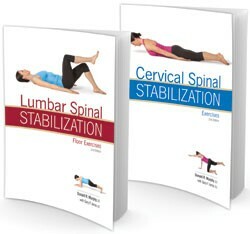 Each of his Spinal Stabilization second edition books has been completely transformed with additional exercises, revised copy and new full-color images. Simplify the prescription of HEPs with these affordable patient exercise books. Visit optp.com or call 800-367-7393 for more information or to purchase. 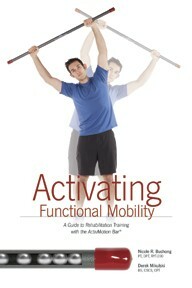 Orthopedic Physical Therapy Products (OPTP) has published a new and exclusive physical therapy exercise guide for the ActivMotion® Bar. Activating Functional Mobility represents a collaboration between OPTP, ActivMotion Bar inventor Derek Mikulski and physical therapist Nicole Bushong. The manual was written to help patients develop the strength, mobility and balance needed to live an enjoyable, pain-free life. The authors provide exercise physiology, scientific research and training methodology as well as over 40 therapy, golf and Pilates exercises that address common rehabilitative conditions. Exercises take advantage of the unique "rolling resistance" of the 4.5-pound ActivMotion Bar, a tool distributed exclusively by OPTP. The Bar is filled with rolling weights (ball bearings) that glide smoothly within the Bar itself to create a core-centric training experience. Due to its lighter weight, shorter length (4 feet) and smaller diameter (1.25 inches), the Bar is ideal for physical therapy, Pilates, golf, active aging and corrective exercise. Activating Functional Mobility features a full-body training program with exercise movements that are specifically designed to increase core muscle engagement while improving range of motion. Detailed instructions and color photographs demonstrate each movement to ensure proper technique and promote ease of learning for trainees. To learn more or to purchase the manual and/or the ActivMotion Bar, call OPTP or visit their website.